Ukraine’s ex-defense minister sues Berkut riot police | Russian Legal Information Agency (RAPSI). 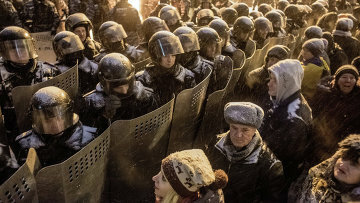 KIEV, January 24 (RAPSI) – Ukraine’s former Defense Minister MP Anatoliy Hrytsenko and lawyer Stanislav Batryn have filed a lawsuit with the Kiev City District Administrative Court to have the actions of Ukraine’s Berkut riot police force declared illegal and illegitimate. “We filed the lawsuit yesterday,” Hrytsenko told RIA Novosti. The plaintiffs demand that the court suspend the orders over Berkut’s actions. Kiev on January 19 turned violent when radicals attacked the police. The rally was being held to voice discontent at the swift approval of legislation to clamp down on protests. The first fatalities were reported on Wednesday, January 22. The death of two people, allegedly in clashes with police, has been officially confirmed. According to forensic experts, both men died from gunshot wounds, however the police do not use the type of bullets that killed them. Prime Minister Mykola Azarov has denied that the police were responsible for the deaths. He said they were not carrying live ammunition.